The purpose of the circulatory system is to provide nutrients to and remove waste products from the cellular interstitium. To do so requires continuous filtration of the interstitium. This filtration is accomplished primarily at the level of capillaries, as fluid moves out of the capillaries at the arteriole end and back into the capillaries at the venous end. The efflux or influx of fluid from or into the capillaries is determined by the local pressure differences across the capillary wall. In normal situations, the pressure drop through the capillaries is substantial, about 25 mm Hg. where p is the coefficient of capillary resistance. 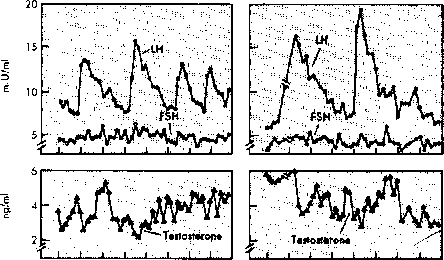 Flow into or out of the capillary (across the porous capillary wall) is determined by the difference between total internal pressure and total external (interstitial) pressure. The interstitial hydrostatic pressure Pi is typically about —3 mm Hg, and the interstitial fluid colloidal osmotic pressure ni is about 8 mm Hg, while the plasma colloidal osmotic pressure nc averages about 28 mm Hg (although it necessarily varies along the length of the capillary; see Exercise 11). where Kf is the capillary filtration rate. We assume that only Pc varies along the length of the capillary. Clearly, when Pc is high, fluid is forced out of the capillary, and when Pc drops sufficiently low, fluid is reabsorbed into the capillary. R tanh PLis the total influx at x = 0 and R = pL is the total resistance of the capillary. Notice the similarity of this formula with (15.1), describing the relationship between flow and pressure drop in a nonleaky vessel. 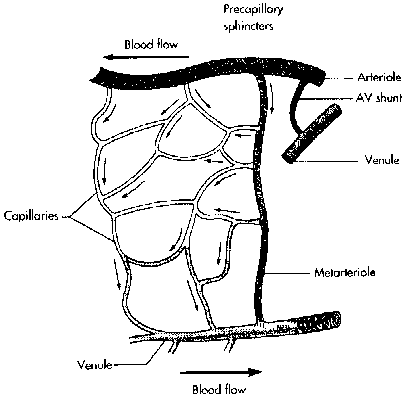 Apparently, leakiness in the vessel (j = 0) has the effect of decreasing the overall resistance of the capillary flow. The filtration rate depends on the single dimensionless parameter jL = ^pKfL. Thus filtration is enhanced in vessels that are "leaky" (large Kf) and of small radius, since vessel resistance p is inversely proportional to r4.